TS EAMCET 2019: It is commonly called as Telangana State Engineering, Agricultural and Medical Common Entrance Test. TS EAMCET is an entrance examination required for admission to some engineering and medical colleges in the states of Telangana, India. The TS EAMCET is a yearly examination taken by a large number of engineering and medical aspirants in Telangana. Jawaharlal Nehru Technological University, Hyderabad conducts TS EAMCET examination on behalf of Telangana State Council of Higher Education (TSCHE). Telangana EAMCET 2019 will be held this year also in the month of May. It is a state-level entrance exam for those candidates seeking admission in Engineering, Agriculture & Medicine (Pharmacy, Veterinary etc). TS EAMCET application form will be available from March on the official website www.eamcet.tsche.ac.in. Students can visit the portal and fill the application form of TS EAMCET. Application form can be filled through online mode only. Open the portal of TS EAMCET. Click on the link “Apply Online”. Fill the application form with all personal details, upload photograph & signature. Candidates will be able to correct or rectify their wrong entered details till the last date of correction of the application form. Take the print out of application form. It will be submitted at the examination time. As the time extends the amount of late fine will be increased. You can fill the application form till the last week of April with Rs.10000/- as late fine. The application form will be available in online mode only. Candidate should be an Indian citizen. The aspirant should belong to Telangana. Must pass 10+2 with PCB or PCM with minimum 45% marks (General) and 40% marks (reserved category). The minimum age for Engineering & Pharmacy should be 16 years as or on 31 Dec 2019. There is no maximum age limit. TS EAMCET 2019 exam pattern will be decided and published by the authority of JNTU, Hyderabad on the site of EAMCET. Telangana EAMCET exam pattern will contain all the information regarding exam pattern like time duration, the total question asked, total marks, number of questions asked from each subject, mode of paper. Exam Pattern will be helpful for scoring good marks. The examination will be held in online mode only. Paper will be available in English, Urdu and Telugu languages. Total duration will be 3 hours. Each question carries 1 mark for the correct answer. No marks will be deducted for the wrong answer. TS EAMCET Syllabus will be different for engineering, agriculture, and medical students. Syllabus for TS EAMCET will be prepared according to their subjects or streams. A candidate who will appear for the exam should check Telangana EAMCET 2019 syllabus for preparation. You can download the detail syllabus. TS EAMCET Previous Year Sample Paper can be downloaded from the official site. Here we providing TS EAMCET last Year Question paper. You can check it and also download it with the solution in PDF format. 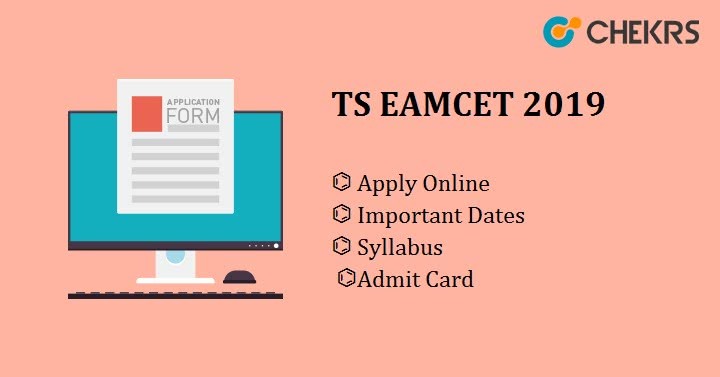 TS EAMCET admit card will release in the month of May, 2019. JNTU, Hyderabad will publish Telangana EAMCET 2019 Hall Ticket online on the official site. Applicants who will be submitted the form successfully can download their Telangana EAMCET admit card. Visit the portal of EAMCET. Click on download Hall Ticket link provided there. Enter candidate registration number, hall ticket number of qualifying exam and date of birth and submit it. TS EAMCET admit card will appear on the screen. Take the print out of it and must carry at the examination time. Note: Without admit card, Candidate will not be allowed to enter in the examination hall. TS EAMCET 2019 Cut-Off will release by JNTU for candidates seeking admission in engineering, agriculture & medical courses in colleges across Telangana state. TS EMACET cut-off varies according to many factors like a number of student appearing, highest marks, last year cut-off etc. cut-off is the closing marks which aspirants must secure for admissions in engineering and agriculture & medical programme. Those who will clear the TS EAMCET merit list will be called for counselling in the various participating colleges across Telangana. TS EAMCET Result will release in the 4th week of May 2019 on the TS EAMCET portal by Jawaharlal Nehru Technological University, Hyderabad. To access the TS EAMCET Scorecard, the candidate will have to enter the registration number, hall ticket number and date of birth. TS EAMCET Rank Card will contain the information of students like Candidate Name, roll number, registration number, stream, marks obtained and combined Score, TS EAMCET and inter weightage, rank obtained in TS EAMCET etc. individually. Eligible candidates who qualified the Exam and having their name on TS EAMCET Merit list will be called for the TS EAMCET counselling in the various participating colleges across Telangana. After completing the Counselling, Candidates will also get admission in various participating colleges across Telangana. they have to pay the remaining fee and verify their Document at the reporting time.